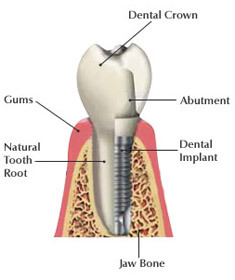 A dental implant is essentially a substitute for a natural root and is a titanium screw or cylinder. Each implant is placed into the precise location of the future tooth. Dental implants form a stable foundation for replacement teeth that look, feel and function just like your natural teeth. Dental implants also preserve the remaining bone by providing the stimulation previously provided by the natural tooth roots. This helps retain the shape of the face, reducing the sunken appearance sometimes seen when the bone diminishes after tooth loss. If you have just one natural tooth missing, then one implant is normally all that would be needed to provide a replacement. Larger gaps, where there are two, three or more missing teeth, do not necessarily need one implant per tooth; however the exact number of implants will depend on the individual. In cases where there are no teeth in either the lower or the upper arch or both arches, it is possible to restore a full arch on fixed bridgework supported totally by implants. It is also possible to secure a denture in place using retentive studs on which an overdenture is fixed. This can be done with a number of implants from two upwards, depending on the individual. The placement of the implants preserves the remaining bone, preventing shrinking of the gum and the resultant overdenture is very firmly retained with little or no movement. It is better to wait until someone has stopped growing before implants are placed. The minimum age is therefore about 19 years old, but there is no upper limit to the benefits of implants. If you have good general health, dental implants will almost certainly work for you. If you have a slightly more complicated medical condition, we will discuss this at the consultation stage. It is rare to have health problems which would prevent you having dental implants. If the missing teeth are in a clearly visible part of the mouth, we can provide simple plastic dentures or removable bridges as a stop gap.